These are some of the signature coaching resources and tools that I've developed to use with my clients. I'm posting these so they can be used -- this will give you an idea of how I work with clients, but most of the materials are self-explanatory, so you should be able to use them on yourself without a problem. Just please make sure to respect the conditions below. You must attribute the work to the author (but not in any way that suggests that they endorse you or your use of the work). INSTRUCTIONS: Right click an image to download and save a copy in pdf format. 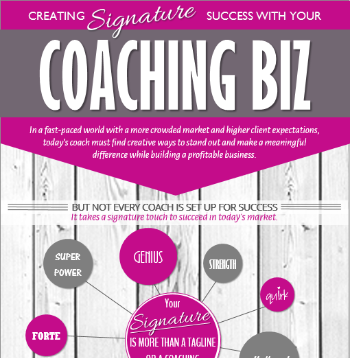 This infographic explains key concepts and tips for designing a signature coaching business. Right click to download the graphic as a pdf. This is a 6-part model for a new signature talk I'm working on. 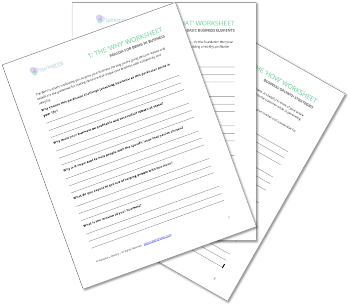 These three worksheets will help you get clear on the why, what and how of your signature coaching business. 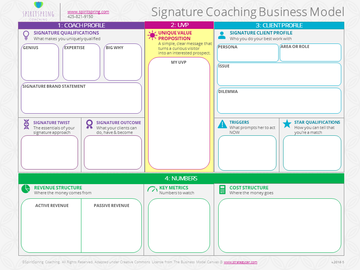 This is a really cool tool I use with clients to outline their signature coaching business model at a glance. It's adapted (with permission) under Creative Commons License from The Business Model Canvas @ www.strategyzer.com. Want some help with your signature coaching system? The first step is for us to have a quick chat about your situation.